The Export Chart tool allows creation of test charts based on device color values (e.g. RGB, CMYK, 7 Color etc. ), which can be stored as PDF, TIFF or PSD files to be printed. The window has three different panels. On top, a Preset covering all the settings can be selected, manual presets can be created, saved or deleted. 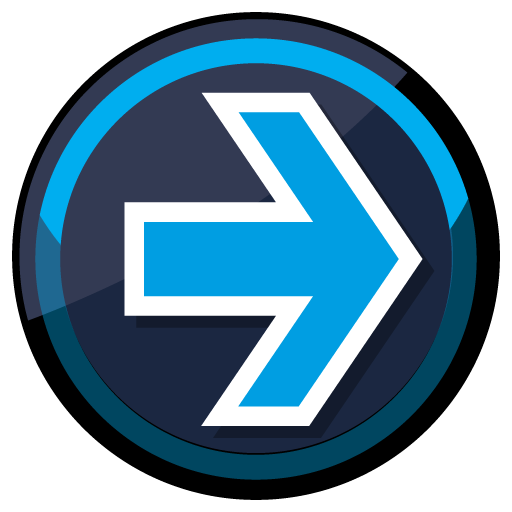 The largest panel covers settings for Chart Dimension, Patch Sizes and additional Options. The panel on the bottom provides information of how many files will be created with the chosen Preset and settings and buttons to Cancel or create (Start) the test charts. The preview area on the right side shows the Patch distribution on all generated pages. Changes of the Chart Dimension, Patch Sizes and Options can thus be evaluated directly. Note: Non-supported instruments may require software from the specific vendor for generating a test chart from our reference data. Read this article about using ColorLogic reference data in other programs such as X-Rite i1Profiler to generate test charts for the X-Rite iSis. Select the reference file with the required device color values and load this information into Measurement Data. Available reference data for different color spaces are stored under Data/ Predefined data or create your own reference data with the Custom Chart tool. Open the tool Export Chart to define the proper settings for creating a test chart for the applicable measurement device. It is recommended to select a Predefined Preset in the drop-down menu that fits your instrument type and size requirements. The Broom icon can be used to delete edited presets if they haven’t been saved yet. For a custom chart or patch size edit one of the predefined presets. The edited version will be marked as (edited). For the custom settings to be saved click the save icon and give the preset a name. Saved presets will be listed under the SAVED divider line in the drop-down menu. After defining the settings (more details in the next chapter Settings and Options) ColorAnt will display, how many pages the test chart will require. A larger Chart height allows more patches per page and reduces the number of pages required. Click on the Start button and the test chart will be exported. In the Save dialog define file name and Format (TIFF, PSD or PDF). 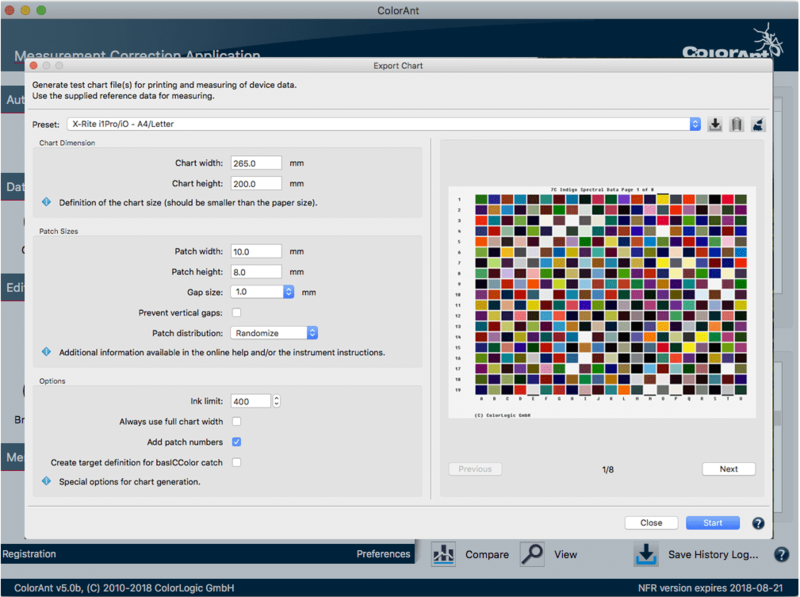 ColorAnt generates the required test charts and a new reference data fitting the layout you have previously defined. Please use this newly generated reference data and not the one loaded under point 1 for measuring the patches and profile creation. Measuring instruments may have specific needs regarding patch sizes, the gap between different patches and the size of the overall chart. In addition, you may respect the requirements of your print process and eventually reduce the Ink Limit (TAC). Patch Sizes: Allows to define the Patch width and Patch height of each color patch. Select the Gap size from the drop-down menu. Use Auto as a default or None if no gaps between patches are needed. Some instruments can work with a very small gap of 0.5 mm some require 1 mm. For rough surface substrates and low resolution printers a 2 mm gap may be helpful. For further information consult the instrument documentation. Patch distribution: Defines the distribution of patches on the test chart. Randomize: Color patches are distributed randomly. Normal: Color patches are distributed as specified in the reference file. Sorted: Color patches are sorted from light to dark. This might be helpful to modify a random chart into a well sorted layout or if you may export a color wedge of one single color. Note: Randomize is applied every time you save the file. So it is not possible to save the same reference file with the same random patch order twice. If it is however wanted, we recommend the following workaround: Save your chart with Randomize and open the generated reference to save it again using Normal. Chart Dimension: Define the image size of each individual test chart. Enter the desired Chart width and height to limit the space that might be used for the color patches (minus the space required for labeling the patches). This is the image size, not the paper size. The exported test charts can be positioned on the required paper size afterwards and then be printed. Prevent vertical gaps: Removes the gaps between rows (gaps between columns remain). Depending on the chart size, several additional rows may fit on one page. Scan Options such as chart size, Rows per page and Gap Size are stored in the reference file. When measuring the test chart using the Measure Tool (v2, included from ColorAnt 5), all supported measuring devices that have Setup Wizards (for example the i1iO, Konica-Minolta FD-9 and the Barbieri devices) can read out this data and automatically import it. When creating one-page test charts, ColorAnt tries to preserve the layout of the rows and columns during export, which can lead to an under-utilization of the chart width. To prevent this activate the checkbox Always use full chart width. Note: Please consider the documentation of your measurement device. Some measurement devices allow measurement rows of patches by swiping over the rows. Those types of devices use rulers that can measure up to a certain width which need to be taken into consideration when the Chart width is defined. The instrument documentation will tell you if a patch delimiter is required and will inform you about the minimum patch size. Ink limit: Allows limitation of the TAC for exported test charts. Typically each of ColorLogic’s CMYK and Multicolor test charts have patches with a maximum of 400% ink. If that is too much ink for the printing method or you require a certain ink limit, the desired Ink Limit can be entered. ColorAnt uses a sophisticated ink limiting algorithm that does not just clip values. Note: Use the exported reference file for measuring and profiling so reference values and test chart fit each other. Please note that the reference file will be ink limited, otherwise profiling would be leading to incorrect ICC profiles. Third party profiling applications may not be able to retain ink limit data. In addition, when building the ICC profile either use the same or a lower ink limit (called Max.Ink in ColorLogic CoPrA) than defined in the test chart. In most cases a decrease of the ink limit is not necessary for test chart creation. Add patch numbers: Enabled by default. Disabling the option removes the numbers from patches. Create target definition for basICColor Catch: When enabled, an XML reference file is generated in addition to a TXT reference file for basICColor Catch for measuring.